Food systems are evolving rapidly throughout low and middle-income countries, and value chains are becoming longer in the process. Foodborne disease risks occur along these increasingly complex value chains, while consumer demand for safe food is growing. In areas such as sub-Saharan Africa, where more than 70 percent of food comes from traditional, informal markets, how can researchers support capacity to provide access to safe food? 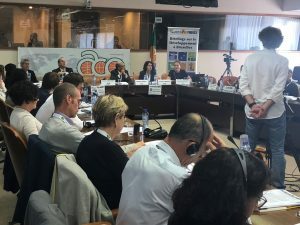 This was the subject of remarks given by Kristina Roesel, Jointly Appointed Scientist at Freie Universitat in Berlin and the International Livestock Research Institute in Nairobi, during the September 19 Brussels Development Briefing, "Food Safety: A Critical Part of the Food System in Africa." Roesel conducts work as part of the CGIAR Research Program on Agriculture for Nutrition and Health's (A4NH) Food Safety research flagship. Her presentation drew attention to the complexity of sub-Saharan Africa's very heterogeneous system of informal markets, and work she and other A4NH researchers are conducting to improve food safety under very diverse circumstances. In her presentation, Roesel noted several reasons efforts to improve food safety in informal markets have not been successful to date. Among them, standards used have been drawn largely from the European context, which are decades old and built for a completely different system. Moreover, there is a lack of data on the presence and burden of foodborne disease in informal markets, which leaves researchers unable to make recommendations for risk-based management of food safety problems. She also highlighted gaps in understanding how to organize and manage food safety efforts in such a diverse market systems, as well as a lack of supply to meet the large and growing demands of farmers for training on standards. Despite these challenges, the answer, she noted, is not to focus only on the formal markets, at the expense of informal markets. Food routed through formal markets tends to be bound for export, so food safety interventions targeted there would not benefit the local consumers, who purchase almost exclusively through informal markets. 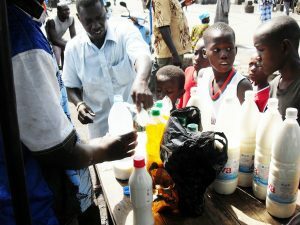 Instead, Roesel said, she and colleagues are focusing on better understanding the informal markets — generating the evidence on foodborne disease risks, as well as critical control points (for instance butchers or milk traders) for mitigating these risks at various stages of the value chains with "light touch" interventions. They also study the local consumer — what they know about food safety, what they want, and what they need. Understanding the demand could potentially create incentives for value chain actors to respond, particularly in better-off African countries or urban centers. "We are not reinventing the wheel," she remarked. "We are looking to build capacity of food handlers in good hygienic practices, paired with skills and development and the use of existing technologies in new ways that are cost-effective, acceptable to the users, and have high return on investment." She cited examples including working with butchers to keep flies off meat with insecticide-treated nets, and simple tools that can help farmers test milk and keep any infected milk out of the larger supply they are adding to a communal collection to be taken to market. Testing techniques such as this helps build the evidence base, Roesel said, which enables researchers to inform policymakers and regional economic communities and help engage local policy, to adjust existing management options as well as the working environment of food handlers. These steps are designed to lead to a gradual, informed, and logical formalization of informal markets, and better health outcomes for those who use them.